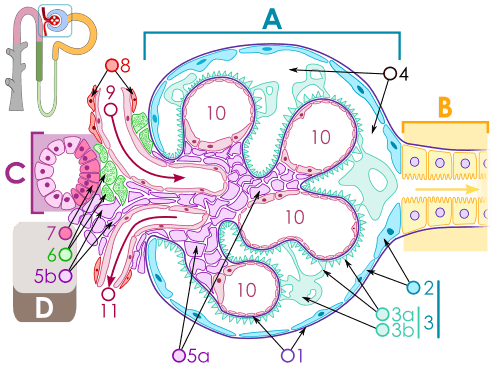 The glomerular basement membrane (GBM) of the kidney is the basal lamina layer of the glomerulus. 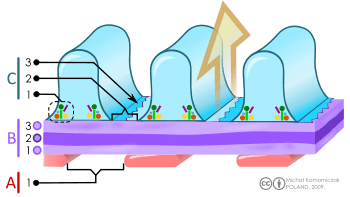 The glomerular capillary endothelial cells, the GBM and the filtration slits between the podocytes perform the filtration function of the glomerulus, separating the blood in the capillaries from the filtrate that forms in Bowman's capsule. The GBM is a fusion of the endothelial cell and podocyte basal laminas. 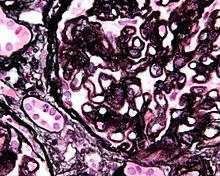 Goodpasture's syndrome is also known as "anti-glomerular basement membrane disease". Capillaries become inflamed as a result of damage to the basement membrane by antibodies to alpha 3 NC1 domain of type IV collagen. Renal corpuscle. GBM is #1. ↑ Jarad, G.; Miner, J. H. (2009). "Update on the glomerular filtration barrier". Current opinion in nephrology and hypertension. 18 (3): 226–232. doi:10.1097/mnh.0b013e3283296044. PMC 2895306 . PMID 19374010. ↑ Physiology: 7/7ch04/7ch04p07 - Essentials of Human Physiology - "Basement Membrane"